Fast Forward To Hell……. 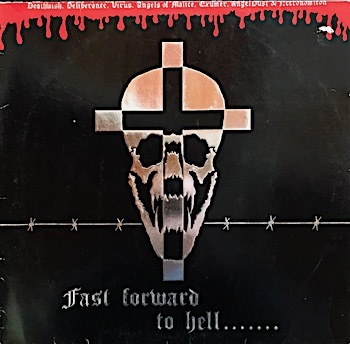 is a 1987 label comp from Metalworks featuring thrash and speed metal bands from England and Germany. Seven bands, ten songs, and a whole lot of speed and power. High points include Angel Dust’s “Legions of Destruction” and Necronomicon’s “Possessed By Evil”. The recording quality is variable – a few tracks sound more like demos that were recorded in someone’s practice space, though most are at least adequate. I’ll definitely be on the lookout for albums by these German bands when I’m in Berlin this summer. Looks like most of the Germans have had their 1980s albums re-released in the last few years, so while I’ll try for OG pressings it looks like I should have some luck one way or the other. This entry was posted in Heavy Metal and tagged Angel Dust, Fast Forward To Hell......., Heavy Metal, Thrash by Administrator. Bookmark the permalink.